devTOXqP TM is a biomarker-based, human, in vitro assay for prediction of developmental toxicity. It utilizes key, predictive biomarkers identified using Stemina’s metabolomics platform. devTOX quickPredictTM is as predictive of human toxicity as the required in vivo tests and more predictive than other alternative assays. All values based on literature review of other systems and known/suspected human developmental toxicants. *Current required in vivo tests **Assay accuracy compared to suspected human developmental toxicity potential. Table Reference: Palmer JA, Smith AM, Egnash LA, Conard KR, West PR, Burrier RE, Donley EL, Kirchner FR. Establishment and assessment of a new human embryonic stem cell-based biomarker assay for developmental toxicity screening. Birth Defects Res B Dev Reprod Toxicol. Choose undifferentiated human embryonic stem (hES) cells or induced pluripotent stem (iPS) cells. 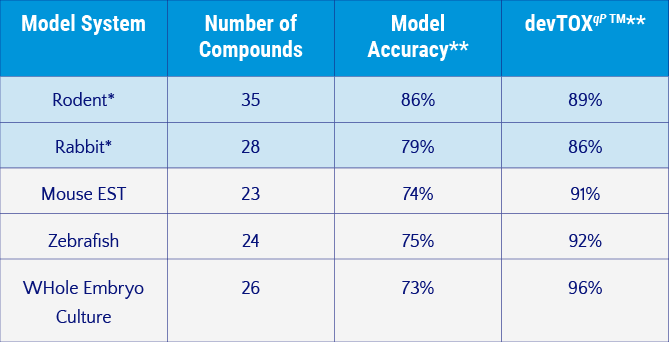 The assay is performed using cells exposed to eight different concentrations of each test article, which offers a broader look at developmental toxicity potential. Read Stemina’s paper on development of the devTOX quickPredictTM assay, published in Birth Defects Research. Read our devTOX quickPredictTM Brochure. Human pluripotent stem cells are exposed to eight concentrations of each test article. Spent media is collected to determine changes in ornithine and cystine via LC-MS analysis and cell viability is measured. The biomarker ratio is fitted with a non-linear dose-response model. 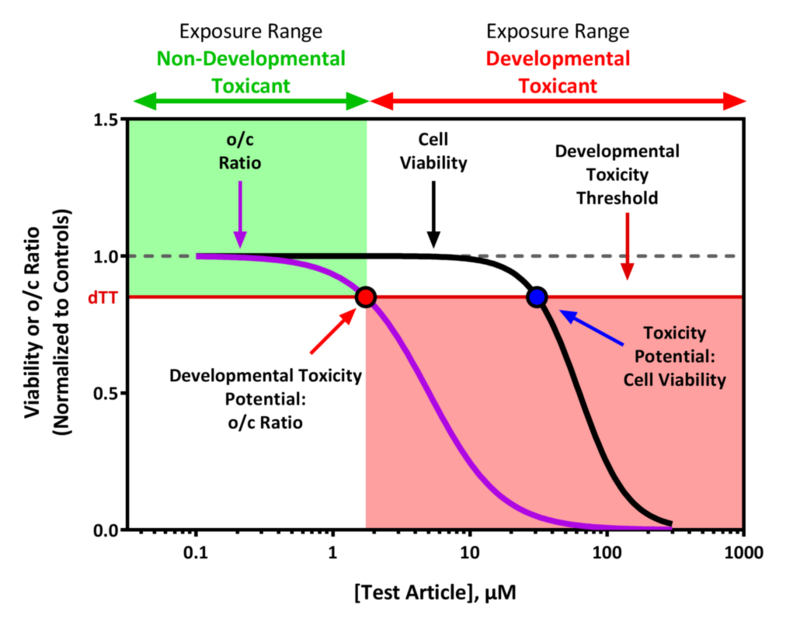 The dose-response curves are used to predict the concentration where a test article exhibits potential for developmental toxicity. A test article shows developmental toxicity potential where the curve drops below the developmental toxicity threshold (dTT). Developmental Toxicity Threshold: Level of change in o/c ratio associated with developmental toxicity. Developmental Toxicity Potential: Test compound concentration predicted to be associated with developmental toxicity. Changes in the o/c ratio can be compared to cell viability.